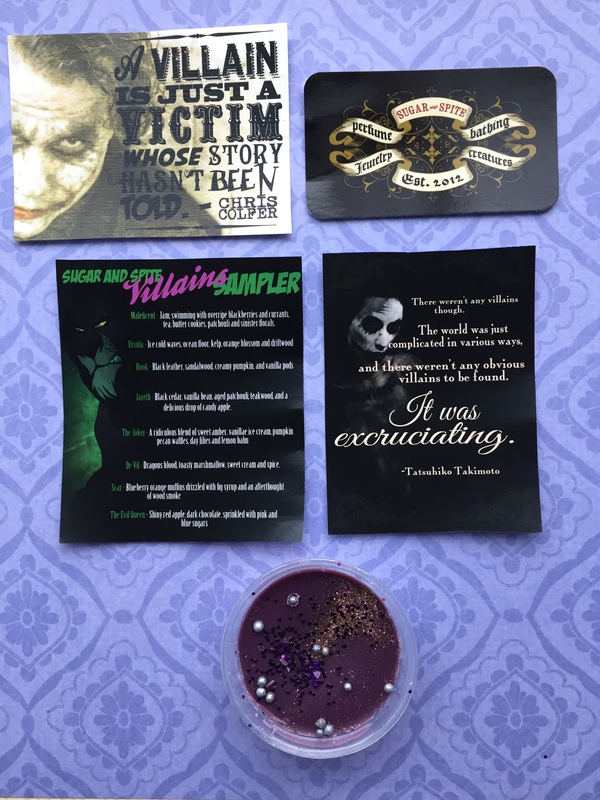 After absolutely loving the Horror Wax Tart Sampler, I was eagerly looking forward to the Villains Sampler, and bought it the day the preorder came out on April 22nd. It shipped out May 4th, and I had it in my wax tart burner by May 7th. I had no problems with my order or shipping, so I was pretty happy. 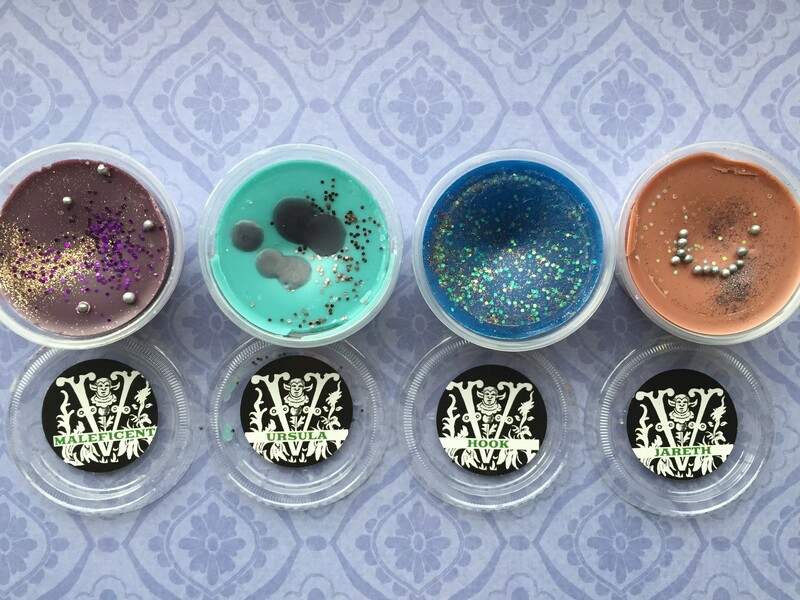 These wax tarts are not currently available for purchase, but I’m sooooo crossing my fingers that there will be more wax tart goodness to come. Good Stuff: I liked all the extra artwork we got with this sample pack. I gave Mr. Danger the cards with The Joker on them, as he is a comic book nerd extraordinaire who happens to love Batman. He was pretty excited about his new artwork. And then the pretty tarts! Lots of glitter this time, and you know I don’t have a problem with that at all. Here we have Maleficent, Ursula, Hook, and Jareth. You can see Ursula and Jareth got a little beat up in shipping, but since I’m just going to melt these, I’m not worried. As for the scents? I think I may have loved this batch even more than the Horror Sampler! As soon as I got the package, I could smell sweet, creamy goodness through the mailer envelope. This smells like some sort of blueberry dessert, it’s both fruity and sweet. Like a warm pie out of the oven. As Mr. Danger is a huge fan of fruity baked goods, this is a hit in our household. Ursula-Ice cold waves, ocean floor, kelp, orange blossom and driftwood. Ursula reminds me of Overlook from the Horror Sampler, in that it seems to be the more atmospheric scent of the bunch. It smells like a very fresh, clean aquatic to me, light and breezy. Its the kind of scent you can put on when company is coming over and they’ll think you are a clean, sophisticated person. I like the aquatic theme here, it’s nice for summer and it fits the Sea Witch character. Hook-Black leather, sandalwood, creamy pumpkin, and vanilla pods. Jareth-Black cedar, vanilla bean, aged patchouli, teakwood, and a delicious drop of candy apple. This scent reminds me of the Sweeny Todd scent in the Horror Sampler, (I don’t remember the name because I’ve been calling it “Man Berries” to this day, sorry), as it’s a very masculine twist on a wax tart. Jareth smells like straight up cedar and woods, with just a bit of sweet apple in the background. I actually really like it, though I think it leans more fall than summer in terms of scent profile. Of all the wax tarts, I also think this one fits the villain’s character really well. Of course a tight pant-wearing Goblin King smells like cedar and vanilla. It just makes sense. The Joker-A ridiculous blend of sweet amber, vanilla ice cream, pumpkin pecan waffles, day lilies and lemon balm. Whoaaa, this one is super, sugary sweet. It smells like being in the middle of a candy shop that’s making waffles with lemon frosting. I personally think it’s pretty fun, but I also like gourmand type scents. Mr. Danger finds it a bit too sweet for his tastes, but it did inspire him to do some baking, so I think it was a win for me. When the green and purple of this tart melt together, it turns grey, which is a bit weird, but also fitting for The Joker. For some reason, this is one of the lighter scents in the collection, it didn’t have quite the throw/power of the other wax tarts as it burned. Though it still smelled delicious. De Vil is a really creamy, sweet tart. I thought it was actually white chocolate scented before I saw marshmallow in the scent list. There’s also a hint of spice that keeps it from being too sweet. After it melts down this tart turns grey with red glitter, which I guess matches Cruella’s evil heart. Scar-Blueberry orange muffins drizzled with fig syrup and an afterthought of wood smoke. This starts off with an extremely berry/fruity note, that I intially thought was grape. It just had that super deep, fruity smell that I associate with grape scented things. However, as it burned I did pick up some citrus scents and a little hint of smoke. 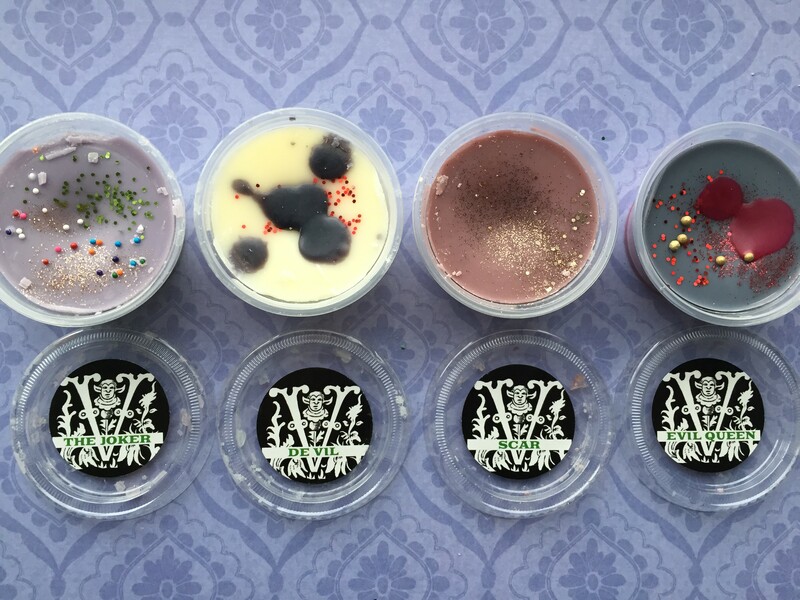 Scar will be the wax tart that I use when I’m in a fruity mood, that blueberry is intense. Evil Queen immediately smells like chocolate and apple to me. It reminds me of a Halloween candy, but I can’t put my finger on exactly which one. Maybe a Tootsie Roll Pop? Either way, I really like this sweet, but fresh, chocolatey scent. This tart was pretty subtle when I burned it, so it’s perfect for putting on when guests come over. You won’t have people shouting about what baked goods you are serving when actually you are ordering pizza because you are super lazy. I really missed my calling in photojournalism, I know. 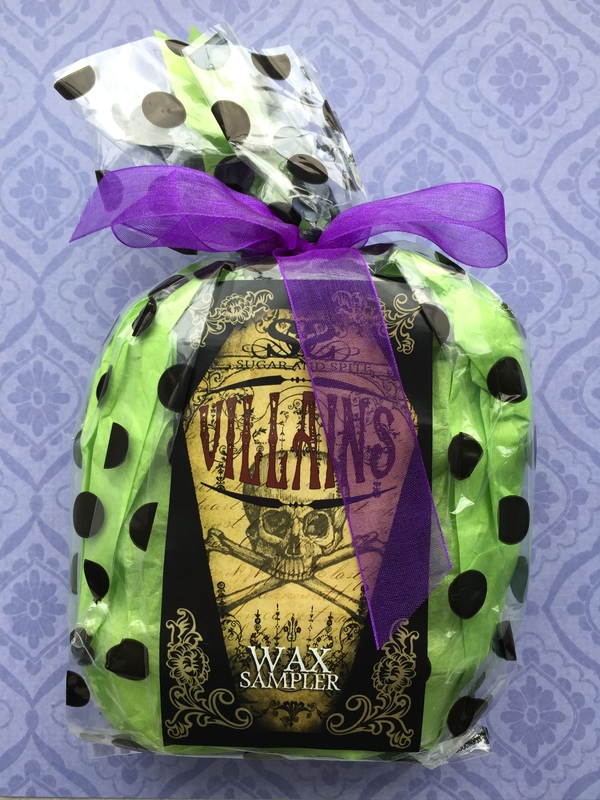 I hate to play favorites, but I think as a collection, I might have loved the Villains Wax Tart Sampler, just a smidgen more than the Horror Wax Tart Sampler. 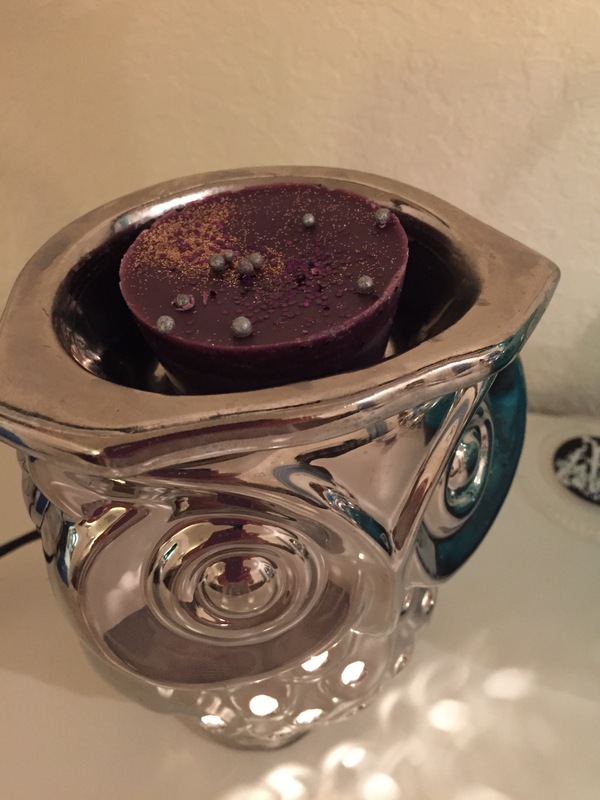 Mainly: I thought this set had some really wonderful and unexpected combinations of scent notes, that filled my whole house up with yummy goodness. I specifically loved Hook, Jareth, Ursula, and The Joker, though they really all worked for me in one way or another. The Horror Sampler was also pretty amazing, but I like the range in this Sampler pack a bit more. These wax tarts also have amazing longevity, the longest I’ve burnt one is for about 8 hours and it’s still going strong. Most of them fill my whole house up with their scents and I can smell them even when I’m upstairs. So, I’m pretty much now a raving Sugar and Spite wax tart fan girl. 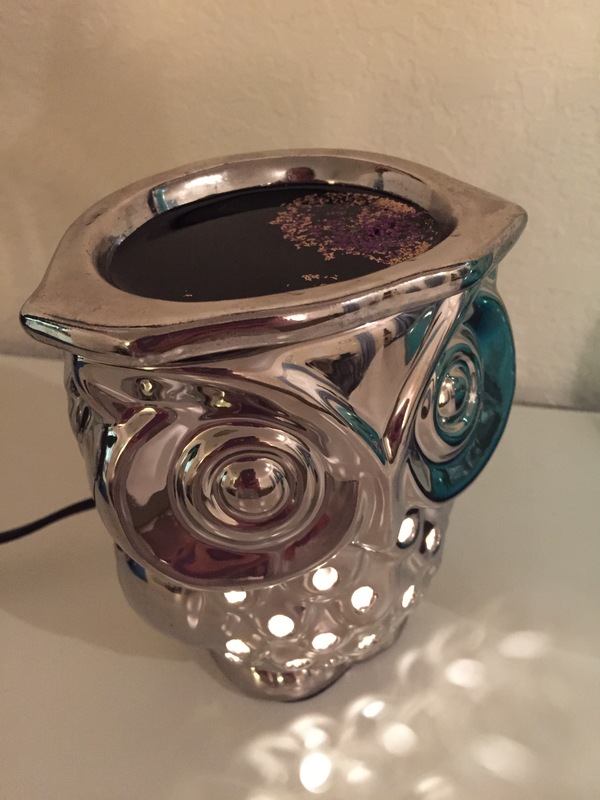 I love having these burning in my house, they always make it smell more cozy, and it’s a nice little treat to enjoy the time I spend at home. 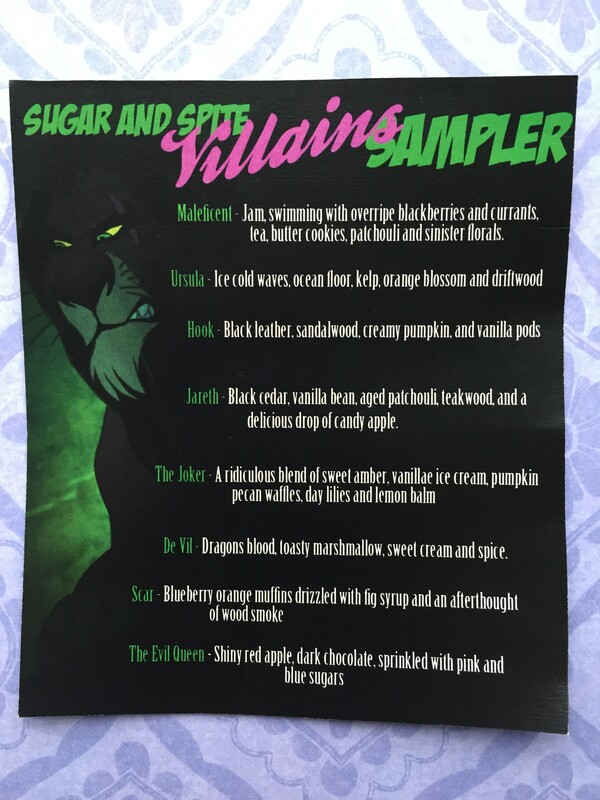 Basically Sugar and Spite could release a “Dumper Smells” Wax Tart Sampler and I would say, “YES, PLEASE.” (Though I would be afraid. I can’t lie.) Anyway, I really hope she continues to make these tarts, because they are fantastic. 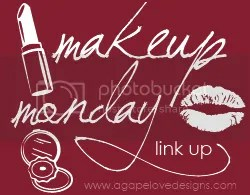 -How have you guys been?! 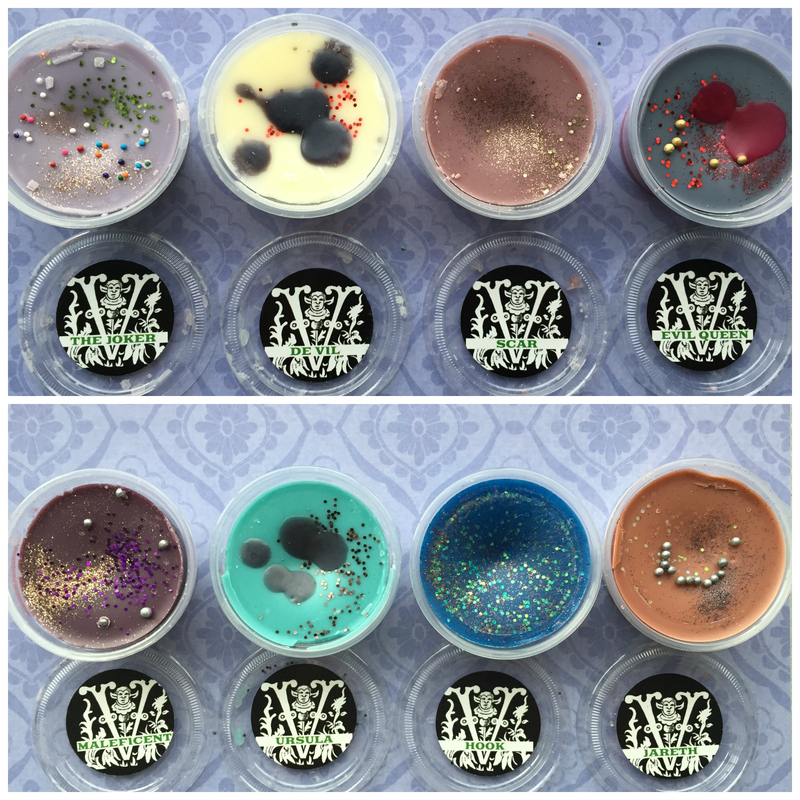 -Did you get a chance to try any Sugar and Spite wax tarts? 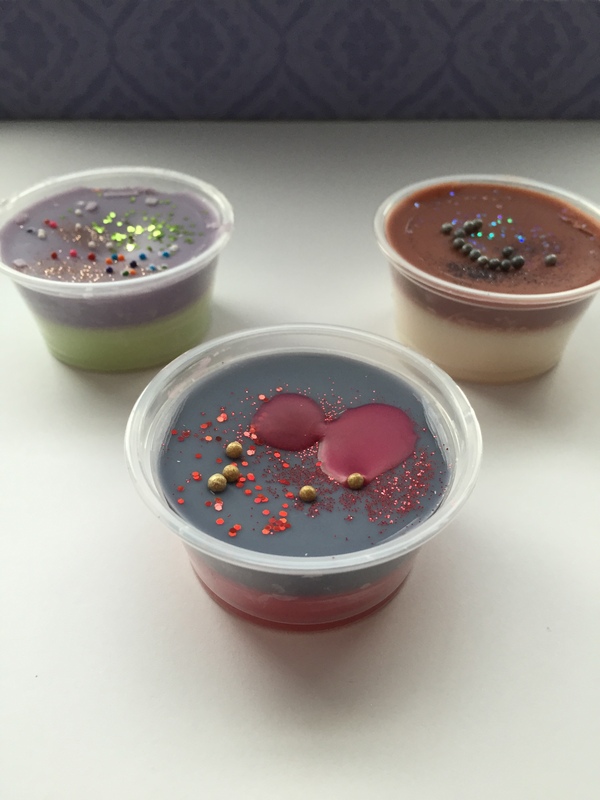 -Where would you draw the line on Wax Tart scents? I clearly have no standards. 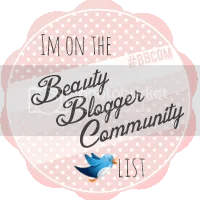 See you Wednesday for a Summer EOTD/BOTD! They’re really pretty! Even though I’ve melted all of them, the glitter still hangs out at the top.